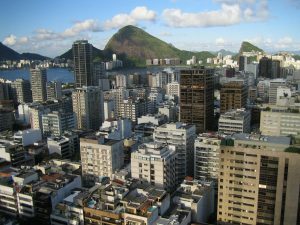 RIO DE JANEIRO, BRAZIL – Rio de Janeiro’s real estate market is tight and finding affordable places in the Zona Sul (South Zone) can be difficult, especially if one needs a little more space. Therefore, continuing our series of rent prices, we show what R$5,000 can rent this year in the most sought-after areas. Leblon and Ipanema are two of the most sought-after neighborhoods in Rio de Janeiro, photo by Jake Gordon/Flickr Creative Commons License. Leblon is one of the most exclusive and attractive neighborhoods in Rio. It is located next to famous Ipanema and shares the same beach with it, but Leblon is less crowded and more extravagant than its neighbor. In Leblon some of the most elegant bars and restaurants can be found. When Metro Line 4, which is currently under construction, opens Leblon will be even more attractive. Example: This newly renovated apartment, two blocks from the beach in Leblon has 80m². With two bedrooms it is ideal for a family with one child, and costs exactly R$5,000. It is located on Rua João Lira. Next to Leblon lies famous Ipanema, a buzzing neighborhood with many bars and restaurants and also home to most of the foreigners and tourists in Rio. The beach in Ipanema is lively and considered one of the best by locals. Ipanema is also convenient for public transportation, although its metro station is currently closed. Example: This three bedroom apartment lies on Rua Gomes Carneiro in the direction of Arpoador right behind metro station General Osório. It offers 100m² for R$4,000 a month and has a new bathroom and wooden floors. Praia Flamengo offers a local recreational area, photo by Cyro A. Silva/Flickr Creative Commons License. The bustling neighborhood of Copacabana stretches along the 4km world famous beach from Leme onto the Copacabana Fort. It offers a lot of shopping opportunities and is centrally located between Ipanema and Botafogo. Most residential buildings are several floors high and date from the 1930s and 1940s. Example: Located on Rua Aires Saldana close to the Cantagalo metro station, this 130m2 apartment offers plenty of space. It also features a sea view, three bedrooms and two bathrooms and comes at R$5,000 a month. Botafogo is nestled between the mountains north of Copacabana, west to Jardim Botânico and south of Flamengo and has its own little beach, which is more for sports than for swimming. The residential area has seen a recent rise in reputation, as many art galleries and independent movie theaters moved to the neighborhood. Example: This three bedroom apartment on the 6th floor has morning sun. It is 94m² and has two balconies all for R$4,200 per month. The 2008 building features a swimming pool, playground and party room. It lies in walking distance to the Botafogo metro and shopping center Rio Sul. 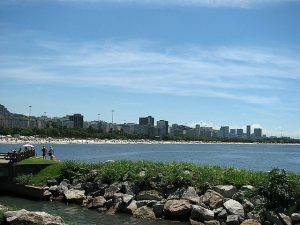 An upper middle-class residential area, Flamengo lies conveniently between the Centro and the beach areas of Copacabana/Ipanema. With the Aterro do Flamengo never far away it offers a local recreation area with a view to the Sugarloaf Mountain. Example: This vast 111m² apartment lies directly at Praia do Flamengo with a view on to Sugarloaf Mountain. It has three bedrooms and 24-hour security and costs R$4,000 a month. Note these prices are for unfurnished apartments, without any appliances, and do not include condominium fees and IPTU taxes. Depending on the building, in this range of apartments it can add R$400 – R$1,000 a month. The “seguro fiança,” a type of renters insurance that is often mandatory for long-term leases, is also not included. I’m truly disappointed at the pricing in Rio and SP these days. Economic growth is slow, and inflation dangerously high. What happens after the WC and Olympics? These property values will plummet, yet renters will be stuck holding the bag for the remainder of their contracts.